Chad Landers is a 1991 graduate of the University of Illinois in Urbana- Champaign with a Bachelor of Science degree in Kinesiology. 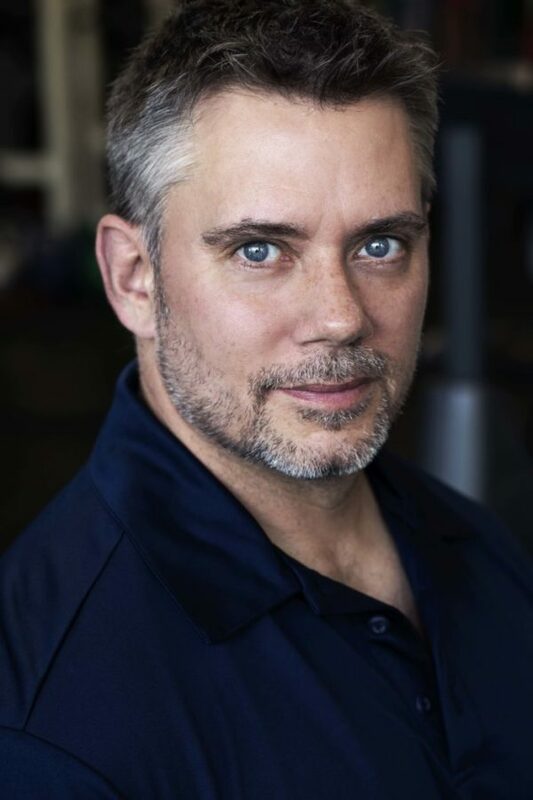 He is a Certified Strength and Conditioning Specialist (CSCS) with the National Strength and Conditioning Association (NSCA), and in 2018 was named the NSCA’s Personal Trainer of the Year. In 2007 Chad became the first American to graduate with a Diploma in Sports Nutrition from the International Olympic Committee (IOC). Chad has been a personal trainer in Los Angeles for 25 years, and has owned his gym, Push Private Fitness, for more than 15 years. He is the former CA State co-chair of USA Powerlifting (USAPL), and is a USAPL Masters Athlete, Coach and State Referee. Chad lives in Studio City, CA and is married to two-time Oscar-winning Sound Editor, Karen Baker Landers. I started playing baseball (T-ball) in the 1st grade and played until 8th grade. It was probably my best sport, but who knows if I could hit a breaking ball as not many kids had anything but a fastball up until that point. Started with football in 5th and 6th grade (flag) and from 7th through high school was in normal, tackle football. I also played basketball from 7th through 10th grade (I sucked) and ran track from 7th through high school. I generally lift weights 3 times a week, sometimes only twice and rarely 4 times. My workouts tend to be whole body training and now that I’m 50, I find myself doing more bodybuilding (higher rep) work and far less powerlifting than I did in my 40’s. I also try to box with a coach 1-2 a week. Do you have any tips for getting to the gym/getting a workout in on days where you just don’t feel like it? Man, I spend 6 days a week at my gym running the place and I still have times when I don’t feel like training. But at 50, I want to stay strong and supple and youthful. So it’s really about priorities. It has to mean something to you inside. Find the “why” of why you’re training and I will be much easier to get there. I always try to think of training as a lifestyle rather than an intervention. What are some of your top injury prevention tips? Warm-up thoroughly. From a general warm-up, to mobility work, to the first couple sets of on exercise, you should be thinking of preparing your body for the workout. Also, listen to your body. I know when I’m just tired and sore, or when I’m sick or injured. I listen and I don’t workout if I’m really not feeling well. I also listen to my body during the warm-up. If something just doesn’t feel right, I may go lighter, skip certain exercises, or go home and train another day. Sleep is also crucial. At a certain age, I think sleep becomes a huge X factor in training and recovery, and thus, injury prevention. Get your ZZZZZZ’s! How do the nutritional requirements of the post 45 athlete differ from the younger athlete? I don’t really push supplements a great deal, but I find us “older” folks tend to not get in enough quality food, (or sleep). So supplemental protein powder, fish oil, creatine and Vitamin D are are areas where they can be useful. Glucosamine can be helpful for us arthritic folks too. But the biggest thing is focusing on lots of quality foods. Don’t eat like your kids, you probably can’t get away with what they do (or what you did at 20 years old!). What would be a good post workout option for athletes wanting to have a whole food meal versus a post workout shake? That can depend on a few factors. Did they eat a large meal before training? Did they have any pre or intra workout nutrition? Etc. Also, what can their stomach tolerate? A lot of people simple can’t keep much down for awhile after a hard workout, so a shake may be easier to deal with that whole foods. Also, are they training again later in the day? If so, they’ll need to focus more on carbohydrate replenishment to get ready for the next practice/training. If I’m done with training for the day, I’ll probably have a “normal” meal of protein (40-50 grams) and starches or fruit and some veggies. If I don’t have time to eat a whole food meal, I’ll probably get a protein shake or milk…or possibly Greek or Icelandic yogurt or a Quest bar…but that’s usually not enough by itself being a 200 lbs. man. Again, the most important thing is what works for you, so you can be consistent at it. If it’s whole foods, great…if its a shake, are bar, that’s cool too. Just be consistent with your nutrition as you would be with your training. And get some more sleep, dammit!